These days many of us want something quick and easy to make in the kitchen. These days many of us want something that's budget friendly. And with the fall weather here, these days many of us may have soup on the brain. How does a soup that's a bit different and outside of your usual soup repertoire sound? Would you believe me if I said you could have a taste of South Africa that's quick, easy, and budget friendly in a comforting bowl of soup? I didn't believe it myself when my friend Kelly prepared this soup recipe in my kitchen. But upon tasting this soup, I was a believer! Reading this recipe I wasn't sure what to think because I was thrown off by how a majority of the ingredients were canned items. Considering that this is a South African based recipe, it made a little more sense to me. In South Africa, corn is known as "mealie" and it's an ingredient they use heavily, especially in soups and stews. This recipe happens to be the most common way to use mealie. In fact, when researching South African mealie soup, I found out that it's even made it's way to Walt Disney World Epcot's Food & Wine Festival and served at the Cape Town kiosk in Florida. To get back to the soup Kelly made, it was fabulous. No really, it was Fabulous! 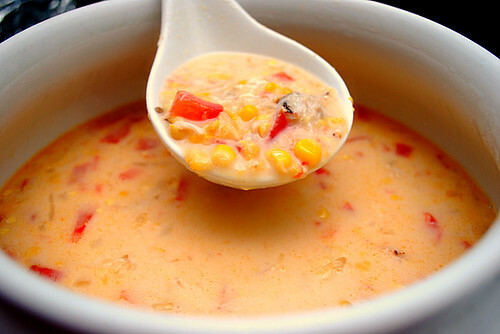 The light creamy soup with bits of sweet corn, chopped tomatoes and onions was delicious and to heighten the flavor and texture, Kelly added fresh lump crabmeat (which is optional). The flavor was very similar to a thinned crab chowder. In fact, if you wanted to make it even heartier, you could add a slurry of cornstarch and water to thicken it up and perhaps some diced potatoes. We are definite fans and I plan on making this soup again during the cold months! In a large saucepan, heat the butter over moderate heat. Add the onions and sauté for 5 minutes. Stir in the tomatoes and cook for a few minutes. Add the corn, milk, stock, salt, and pepper, and simmer for 10 minutes. Stir in the crabmeat and continue simmering for 5 minutes to warm through. Serve with crackers or warm fresh bread. This is a very tempting recipe. Thanks for sharing, again....I think I'll make this later this week. I will be at the Epcot Food & Wine Festival soon and will definitely try this. It sounds really good - my mom makes a similar soup, but with crawfish instead of crab and some additional cajun spices. Great for fall! This looks like such a great alternative to cream-based seafood soups. I'm definitely bookmarking this. Thanks for sharing! Yum!!! I love anything with crab in it. I like the idea of putting cream corn in the soup. Delicious!! This looks perfect for a chilly day, easy too! It is nice to find a blog from Chicago. I am from Chicago and I've moved to Austin, Texas. I can't begin to tell you how I miss Chicago pizza so much! ;o) Thanks for posting the recipe. It looks delicious! Found your site after searching for a Mealie soup recipe. I attended the EPCOT Food and Wine Fest on Friday and tried the soup there. It was delicious and I'm happy to find your recipe to try at home. It was served with a few drops of chili oil.